Southbound: Regular route to 24th & O St, west to 25th, north to L St, west to 30th, south to Babe Gomez Avenue, to MCC South Transit Center. Northbound: Regular route to 30th & Babe Gomez Avenue, north to L St, east to 25th, south to O St, east to 24th, north on regular route. 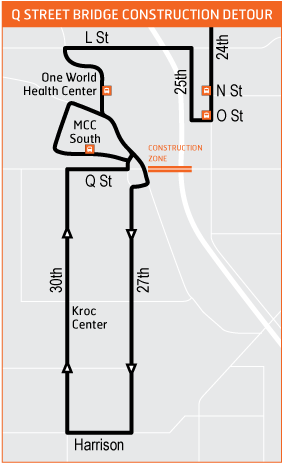 During this time, riders will be able to board route 24 for FREE by presenting a Route 24 Detour bus pass, which can be obtained at the South Omaha Library, or through other social agencies located near the project. For more information, download the City of Omaha’s 26th & Q St Bridge Fact Sheet.